Iran: Ship Face-Off Video "Fabricated"
"The footage released by the U.S. Navy was compiled using file pictures and the audio has been fabricated," the state-run English-language channel Press TV quoted an official in the Revolutionary Guards as saying. State TV did not give the name of the Revolutionary Guard figure and did not offer more details about how the official knew the footage was "fabricated." The Pentagon on Tuesday released a four-minute, 20-second video that included audio showing small Iranian boats swarming around U.S. warships in the Persian Gulf. In the recording, a man speaking in heavily accented English threatened, "I am coming to you. ... You will explode after (inaudible) minutes." 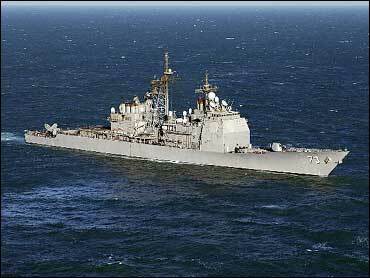 The Iranian boats appeared to ignore repeated warnings from the U.S. ships, including horn blasts and radio transmissions, according to the video, which was shot from the bridge of the destroyer USS Hopper. From the Hopper, after spotting the approaching Iranian boats, a U.S. Navy crew member says over the radio: "This is coalition warship. I am engaged in transit passage in accordance with international law. Intend no harm."